What Is a Non-Alcoholic Mouthwash? Those looking to avoid mouthwash with alcohol can use a simple saltwater rinse instead. Non-alcoholic mouthwash is an oral care rinse that is formulated without alcohol. Like their alcoholic counterparts, these mouthwashes may freshen breath and help protect teeth and gums against bacteria. Users of non-alcoholic mouthwash include children, individuals who object to the use of alcohol on religious grounds, and those who have health concerns about the possible connection between mouthwash and various types of cancer. In addition, some individuals who have significant alcohol abuse problems have been known to drink mouthwash that contains high amounts of alcohol. 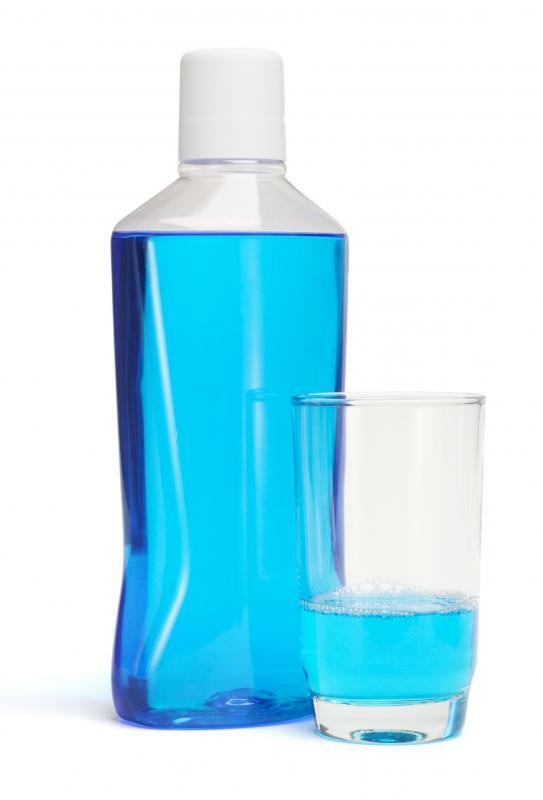 Mouthwashes that are free of alcohol can help those who are struggling with an addiction to maintain personal care standards while avoiding substance abuse triggers. Many types of mouthwash contain a significant amount of alcohol. In most cases, the inclusion of alcohol in their formulations does not cause problems for most people, because mouthwash is not intended to be swallowed and people keep it in their mouths for only the 30 seconds to a minute that it takes to thoroughly rinse the mouth. Still, the alcohol content can pose a risk to individuals who may not be able to control their swallowing, which is why many alcoholic mouthwashes contain a warning label advising against their use by children less than the age of six, as these children may not be mature enough to understand that they should not swallow the mouth rinse. Some individuals may also object to any exposure to alcohol, either because of a substance abuse issue or because their religious beliefs prohibit both alcohol consumption as well as the use of products that contain alcohol. In response to demands for non-alcoholic mouthwash, many oral care product manufacturers now offer a wide range of mouth rinses that are alcohol-free but that are also effective at freshening breath and addressing other oral health issues, such as discouraging the development of plaque. In some cases, a non-alcoholic mouthwash may also have additional properties, such as the ability to whiten teeth. Consumers of non-alcoholic mouthwash should talk to their dentists about recommended types of mouthwash, which should always be used in conjunction with regular brushing, flossing, and professional dental care. Some people make their own non-alcoholic mouthwash from common household ingredients. These homemade mouth rinses may involve diluting baking soda, salt, or a 3-percent hydrogen peroxide solution in water. Users may find these options to be less costly than commercial products and may feel more comfortable knowing exactly what types of ingredients they are using when rinsing their mouths. What Should I Do after Swallowing Mouthwash? What Is the Connection between Mouthwash and Cancer? What Are the Benefits of Mouthwash? What Are the Pros and Cons of Using Mouthwash? How Effective Is Mouthwash for Bacteria? What Is a Pre-Rinse Mouthwash?